President Emmerson Mnangagwa’s youngest daughter, Tariro, right, has joined a group of young female rangers dedicated to fighting poaching in the Zambezi valley. PRESIDENT Emmerson Mnangagwa’s youngest daughter, Tariro, has joined a group of young female rangers dedicated to fighting poaching in the Zambezi valley. 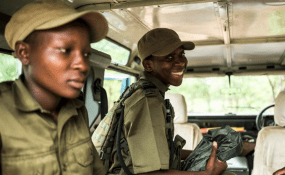 At least 36 women make up the anti-poaching unit which is being trained by the International Anti-Poaching Foundation’s Akashinga field ranger unit to tackle poachers in the region. “Tariro Mnangagwa is a 32-year-old professional photographer who is visiting and training with the International Anti-Poaching Foundation’s Akashinga field ranger unit,” reports the UK-based Observer newspaper. “These women show me hope,” Tariro is quoted saying heads to a beaten-up Land Rover to visit a community in search of a former poacher keen to talk. During her deployment with the group, Tariro conducted training, active duty patrols and engaged in rural community project planning sessions. The unit is the brainchild of Damien Mander–an Australian military-trained sniper. “Thirty-six women started our training, modelled on our special-forces training, and we pushed them hard, much harder than any training we do with men. Only three dropped out. I couldn’t believe it,” Mander said in the article. Apart from eliminating poaching, the programme has also empowered women from abusive relationships, single mothers and from vulnerable backgrounds by guaranteeing a decent income. “Developing conservation skills in communities creates more than just jobs. It makes local people directly benefit from the preservation of wildlife,” said conservation biologist and Chinhoyi University of Technology lecturer, Victor Muposhi. According to Muposhi, the lower Zambezi Valley has lost 11,000 elephants in the past 10 years. It would be good news if it wasn’t for the fact that this is solely political. Comes when Mnangagwa is building a case – whether based on fact or fiction matters little – against Grace Mugabe over Ivory smuggling. The crocodile wants to contrast his family’s sudden desire to save elephants with Grace. Real test will be whether he stops capture and export of live elephants to China.